Released in 1982, a few years before he’d put ink to a multi-film contract with the legendary Cannon Group and deliver ‘80s action classics such as Invasion U.S.A., Missing in Action, and The Delta Force, the oddball Silent Rage is one of those Chuck Norris films that for long stretches of runtime seems to forget that it’s a Chuck Norris movie. A noticeable divergence from the unique action persona he’d cultivate elsewhere, Chuck doesn’t even kick anyone until the film’s 41-minute mark! What if a slasher villain’s prey weren’t lusty teens, but Chuck Norris? That’s the question that Silent Rage seems to have set out to answer. Chuck plays Texas sheriff Dan Stevens, a quiet cop with mean karate skills and a way with the ladies. When a hulking madman flips out on his family with an axe, Chuck naturally tries to bring him in alive for psychological treatment – and his fellow cops, of course, fill the guy with a few dozen bullets instead. A trio of doctors at the local hospital aren’t able to save him on the operating table, but instead hook him up to an IV drip of an experimental healing serum. For a while he remains in a vegetative state, a braindead guinea pig for their unapproved treatments. Can you see where this is going? Eventually the madman wakes up with the ability to recover from fatal wounds in a matter of seconds, and of course the unstoppable urge to kill anyone who crosses him. Look out, Chuck! 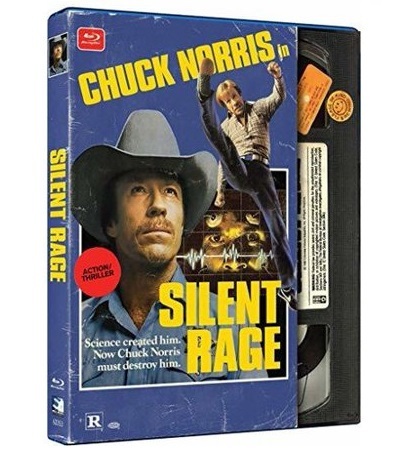 What’s surprising about Silent Rage is that it’s probably most interesting when Chuck Norris isn’t in it. The drama between the scientists who bring the killer back to life is just so perfectly campy, if you’re the type who enjoys listening to grown men bark scientific-sounding nonsense words at each other. (Two are played by Timecop’s Ron Silver and Phantom of the Paradise’s William Finley.) Plus, there’s the sense that a pretty good straight horror film could have been made here had they not taken the kung fu cowboy route with it instead: the stalking and killing scenes, mostly shot in a creepy, handheld, Evil Dead-like fashion, are pretty darn scary. All in all, Silent Rage is a pretty fun action-horror-comedy-science fiction mashup, even if it’s not the most Chuck Norris-y of Chuck Norris movies. Mill Creek really seems to have gone all-in on recreating the VHS experience with this particular entry from their new Retro VHS line of Blu-rays, as the disc contains zero extra features. (Not even a chapter menu! How oldschool is that?) In all seriousness, these are budget releases retailing at $7.50, so you’ve got to go in with the expectation that you’re buying them for the movies alone. They’ve brought Silent Rage to Blu-ray with a really nice HD transfer, sourced from a bright and relatively clean print, and the audio has no issues we came across. In short, it’s a quality upgrade from the muddier DVD presentations you’ve seen in the past. Plus, the packaging – looking like a roughshod videocassette sliding from a weathered rental box – is legitimately cool looking, and should tickle a nostalgic nerve in anyone who looks fondly back on the days of rental shops.